When I am asked what kind of yoga I do or what yoga really is I usually start with saying what it is not. This is not because I am a negative person, but just to clarify what expectations people don't have to bring with them when they want to join in a yoga retreat with me, participate in Yoga classes with me (private or group classes) or to understand yoga in general. Yes, I am form “the West” myself, and I am sick of hearing about yet another “favourite yoga pose, a way to rebuild my body for summer (or winter, or for a lover etc), or a way to juice-cleanse my body for cleansing yoga practices, a yoga practice to strengthen the spine, tighten the buttock and get great abs and fantastic core strength how to redesign my brain, or even how to practice a session of mindfulness” - yes all this and more just makes me feel sick and frustrated. 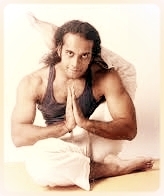 Sure, yoga practices will make you feel better in body and mind, yet an advanced practice does not mean to stand on your head longer or do “postures” - asanas- that are more difficult to perform or to sit longer in silent meditation, as “advanced” has nothing to do with external appearances but with knowing, realising and expressing your best, your true inner nature. And yes, we do practice yoga asanas, because our physical vehicle is the body and we practice pranayama and mediation as otherwise the emotions and our mind control us, yet real Yoga has nothing to do with this outer “performances” or any performances. How do I look? How impressive is this posture? What do I want to achieve next? And for me courage comes in when I just am who I am no matter what. I accept myself howI am and how I am not. I accept my past and where I am now in life. I accept my body the way it is with the things it can do and with the limitations and fears and insecurities that are in me. Though I will go on sharing some yoga practices with you here on my blog and in my newsletters, now I also shared once more with you that the practice never is meant to be the goal - and still I invite you to enjoy it with a smile on your face that helps you to accept the way you are connecting with the practice which again helps to relax into it and trust what comes.